Halloween is just around the corner, and that means there will be a lot of scary sugar. From parties to trick-or-treating to grocery stores, candy can be found everywhere, and it may challenge you on your path to Whole Health. As much as I love M&Ms and candy corn, I know they’re not healthy. The bakery aisle usually tries to compete with their creatively decorated cakes, cookies and cupcakes. Everywhere we turn, there seems to be items just leaping off the shelf and into our grocery cart! Yes, we buy candy for the trick-or-treaters, yet we always find ourselves mindlessly munching on these tempting treats. If you have children, it’s hard not having sweets in the house. For others, it’s about moderation and keeping it out of sight. For myself, there are parties, festivals and other events that just beg for the attention. Enjoy Halloween with your children, but carefully plan ahead of time. Teach sensible eating so your kids can make wise decisions when faced with an overwhelming amount of temptations. Also make sure your child gets a well-balanced meal before trick-or-treating; it’ll reduce the urge to snack afterwards. Don’t be afraid to offer healthy trick-or-treating alternatives! I used to always get frustrated when my parents made me wait to eat the candy I collected. They insisted on inspecting it all first. Rule of thumb — if the wrapper looks suspicious, tampered with or you’re not familiar with the brand, toss it! Another wise rule is to let your child choose a few pieces of candy to eat on Halloween night and then a few pieces each day after that. Restriction can often backfire, leading to an obsession with candy. Use this time as an opportunity to teach about healthy, nutritious eating. Combine a miniature snack bar with a piece of fruit and then teach the benefits of the fruit while encouraging healthy eating habits. Finally, Halloween isn’t just for kids. Adults like to attend and host costume parties for friends and families. If hosting, incorporate other fall favorites, such as pumpkin, squash, apples and other fresh produce. Check PURE’s Pinterest page for some delicious, healthy food choices that all your guests will love! How do you celebrate Halloween? It’s your turn to tempt us with your treats. 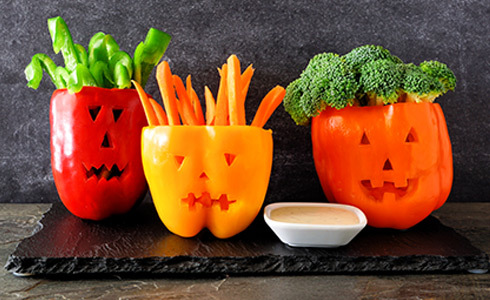 Post your fun Halloween recipes and health ideas on Facebook and tag us @livepureglobal.